ab22550 recognises proteins with acetylated lysine. HeLa cell lysate. MCF7 cell line. Our Abpromise guarantee covers the use of ab22550 in the following tested applications. IP Use a concentration of 3 µg/ml. ChIP Use a concentration of 10 µg/ml. Immunoflouroescence analysis of HeLa Cells labelling lysine acetylated proteins with ab22550. Formalin fixed cells were permeabalized with 0.1& Triton X-100 in TBS for 10 mins at room temperature and subsequently blocked with BSA at room temperature for 15 mins. Cells were then probed with ab22550 at 1/100 for 1 hour at room temperature. The secondary used was a DyLight® 488 goat anti-mouse used at 1/400 for 30 minutes at room temperature. Additional counterstains used were F-actin with a DyLight® 554 Phalloidin and Neuclei stained using a Hoechst 33342 conjugate. Image was taken at X20 magnification. Chromatin Co-Immunoprecipitation (ChIP) analysis using ab22550 binding acetylated lysines in 10E+06 LNCaP cells. Protein binding was detected using real-time PCR. Positive control: Fold enrichment of ab22550. ICC/IF image of ab22550 stained MCF7 cells. The cells were 4% formaldehye fixed (10 min) and then incubated in 1%BSA / 10% normal goat serum / 0.3M glycine in 0.1% PBS-Tween for 1h to permeabilise the cells and block non-specific protein-protein interactions. The cells were then incubated with the antibody (ab22550, 5µg/ml) overnight at +4°C. 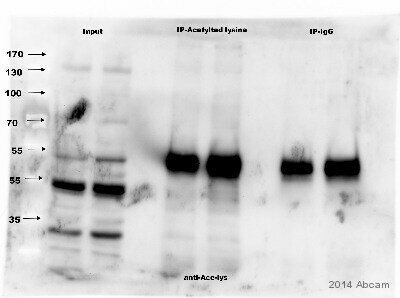 The secondary antibody (green) was ab96879, DyLight® 488 goat anti-mouse IgG (H+L) used at a 1/250 dilution for 1h. Alexa Fluor® 594 WGA was used to label plasma membranes (red) at a 1/200 dilution for 1h. DAPI was used to stain the cell nuclei (blue) at a concentration of 1.43µM. Publishing research using ab22550? Please let us know so that we can cite the reference in this datasheet. Is this antibody has ever been tested in Immunoprecipitation? Thank you very much for your interest in ab22550. To our knowledge, ab22550 has not been tested in IP. Therefore, I can offer a discount off a future purchase if you buy ab22550 now, test it in IPand submit feedback to us in the form of an Abreview. It doesn’t matter whether the Abreview is positive or negative, we would just really like to receive your feedback. The discount would be to the value of 1 free PRIMARY ANTIBODY. If you are interested in this offer, please follow these steps: 1. Reply to this e-mail to let me know that you would like to proceed and test ab22550 in IP. I will then send a discount code. This code must be issued before purchasing ab22550 so please wait for my reply before ordering. 2. Purchase ab22550 either by phone, fax, or online (www.abcam.com). 3. Test it in IP. 4. Let us know the results, positive or negative, using our Abreview system (this will take about 10 minutes and images are great if you have them!). To find out how to submit an Abreview, please visit: https://www.abcam.com/abreviews. 5. After the review is submitted to us, the discount code becomes active. Simply place your new order by phone, fax, or on the web and mention the discount code. The discount can be redeemed for any PRIMARY ANTIBODY ordered and the discount code is valid for 4 months after issue. We are always pleased to obtain feedback about our products and any information is greatly appreciated! Even if ab22550 turns out to be unsuitable for IP, you will still receive the discount on your next purchase after your Abreview has been submitted. Please let me know if you have any questions about this offer and I would be happy to help you further. The Terms and Conditions of this offer can be found at: www.abcam.com/collaborationdiscount. I would like to do some experiments to detect the lysine-specific acetylation of a non-histone protein. There is no sequence homology between the histone acetylation site used as the antigen to develop the antibody. Will the monoclonal acetylation antibody work to detect acetyl-lysine residues on any peptide? Thank you for your enquiry. The synthetic peptide used to raise this antibody was a peptide sequence surrounding the acetylated lysine 9 of histone H3. 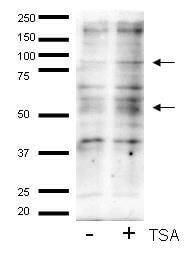 This antibody has been shown to generate a ladder in a HeLa whole cell lysate demonstrating that it has the potential to recognise acetylated, non-histone proteins. I cannot guarantee that it will recognise every acetyl-lysine epitope given that each epitope will vary dependent on the adjacent residues. May I suggest that you consider our monoclonal N-epsilon acetyl Lysine antibody [11A1] (ab409). Mike Schutkowski has left a favourable review following it application against various acetylated lysine peptides. Please do not hesitate to contact me should you require further assistance. 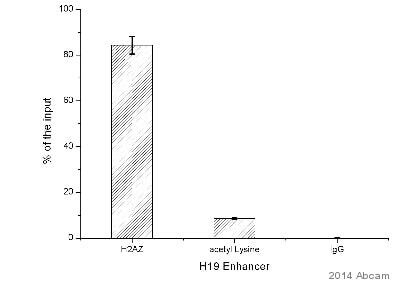 Do you have any information aboutthe ability of this antibody to react with other non-histone acetylated proteins?